With all the trails and recreation opportunities available in the Fort Collins area, it’s easy to forget that the wild terrain of southeastern Wyoming beckons just to our north. Although the secret has already been out for quite some time, there is a vast, granite oasis hidden in this barren landscape called Vedauwoo (Vi De Vu). Named for the Arapahoe word meaning “earth born,” Vedauwoo is a high altitude maze of Sherman granite, dense pine forests and aspen groves that draws mountain bikers, climbers, hikers and snowshoers to its easily accessible location off Interstate 80, 20 miles east of Laramie. (You can view the close proximity to I80 on this map). 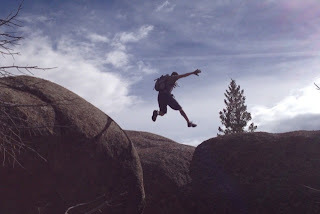 Most passing motorists ignore this area as it isn’t completely visible from the highway (Exit # 329) but a short trip past the exit reveals a startling array of climbing opportunities, wildlife and scenic camping. The University of Wyoming holds a ritual called the Vertical Dance on the cliffs every spring. This event draws hundreds of people and it really highlights how versatile and sacred this area really is. 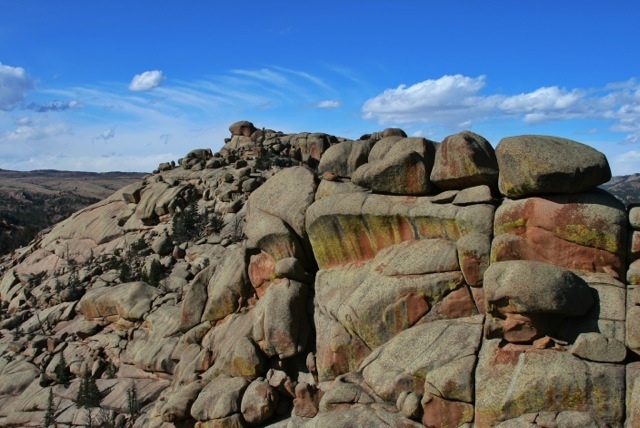 The alien-esque rock at Vedauwoo is 1.4 million year old Sherman Granite, exposed over thousands of years by the gradual uplift of the Laramie Mountains to the south. Amazingly, the Tetons, 8 hours to the north, are still more than a billion years older than this formation. You can learn more about the geology of the region through this interesting Turnstone article. Wyoming also maintains a detailed online database on Vedauwoo and the interesting trails in the region. The randomness and beauty of the area make it immensely popular with Wyoming residents who flock here every summer to climb one of the more than 900-recorded routes in the region and observe the large populations of mule deer, elk and yellow-bellied marmots that call Vedauwoo home. There are 28 semi primitive campsites available at a minimal fee of 10 dollars per night, although many people choose to camp at a non-designated spot further into the park. If a daytrip is what you prefer, a 5-dollar fee is required to park your vehicle. Updated campsite information and alerts can be found here. With incredible views of the Continental Divide and Longs Peak from every angle, it’s a small price to pay for access to such an amazing area. Although the official USFS open date for the area is May 15th, you can still park outside the gates and walk in at any time of year. I can’t wait to get up there and take some updated pictures of those crazy rock formations and infamous crack climbs.